De nuoi. Literally means “easy to nurture/grow” in Vietnamese. Before the inevitable departure she always asks me what I like to eat….for the rest of the week. Yes, I’m very de nuoi. 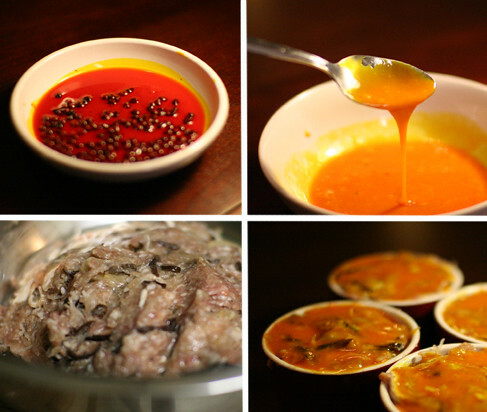 This weekend we came up with Com Tam Suon Bi Cha. Truly a celebration of pork in the midst of the swine flu epidemic. This is a very traditional and special Vietnamese dish that my mom would make growing up in Michigan. It is composed of broken rice (com tam), suon (grilled pork chop), bi (pork skin), cha trung hap (steamed pork-egg custard) topped by scallion oil and dressed with nuoc nam.So we bought all the ingredients and made a call home to my mom back in Michigan to get finer details of this class Vietnamese recipe. My mom never writes down recipes and memorizes things by heart. A bit of this and a bit of that…never any exact amount. I was forever frustrated by this, but over time I grew to cook in the same way—that is, more intuitively with out exact measurements. This dish is composed of several different parts. The bi and cha trung hap can be made in advanced and lasts for days in the fridge. I strayed away from mom’s pork chop recipe by brining my chops in a coriander/Sichuan peppercorn brine. Recipe Approximately serves 6-7. 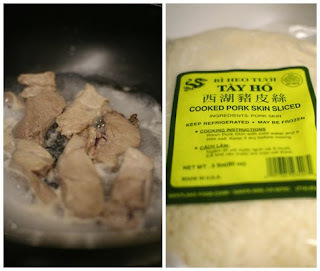 Mix the dry pork skin, pork, salt, and approximately 2-3 oz. of roasted rice powder and garlic thoroughly. Add more roasted rice powder or garlic to taste. Set aside in the fridge until ready. This mixture stores well in the freezer 1-2 months. The Bi is also very popular filling and great in banh mi! Mix pork, bean thread, fungus, pepper, salt and egg whites together and set aside. 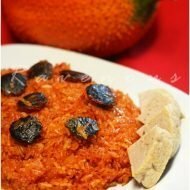 In sauce pain add oil and annatto seeds and cook for about 1 min or until desired orange/red color seeps into oil. Do not burn seeds. Strain seeds and mix cooled oil into egg yolks to get a beautiful orange/red color. 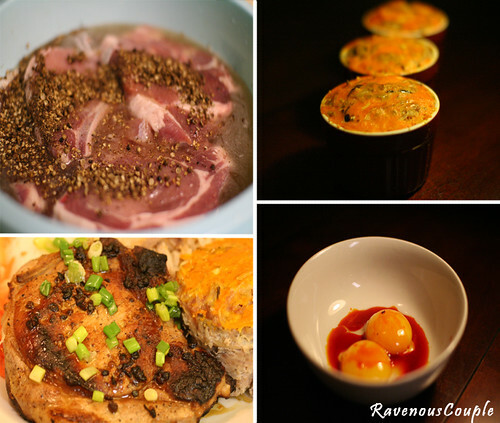 Place pork mixture into baking pan or individual ramekins. Generously layer on the egg yolk mixture and steam for about 30 minutes. This will vary with your pan and thickness of the custurd. Check using sticking fork or toothpick. Com Tam (Broken Rice)Tam refers to the broken rice grains while com refers to cooked rice and found in most Asian markets in the rice section. According to a knowledgeable source, this type of rice was the left over broken pieces of rice that Vietnamese rice farmers couldn’t sell, so they used it for themselves. Very traditional and great texture wise, and probably not as scented as long grain jasmine rice. Not an absolute requirement if you can’t find it. Substitute long grain jasmine rice if not available. Eat daily…yes, very de nuoi.Also, try our other broken rice recipe Com Tam Tau Hu Ky (Bean Curd Wrapped Shrimp). 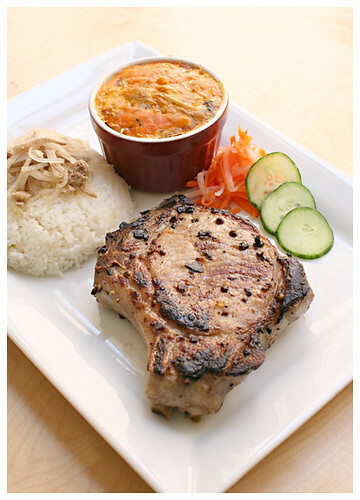 Looks delicious–one of my fav dishes at the local viet place, or a version thereof. Never seen the pork-egg custard before, and the way it was spelled had me giggling, imagining a pig laying an egg. good luck on the blog from one of the (supportive) SE commenters. thanks for support-I can see what you mean by the imagery! There are many different “toppings” for broken rice dishes. 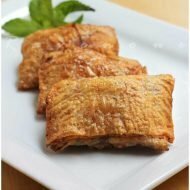 Another one that is very popular is minced shrimp in a tofu wrap (tau hu ky). I’m going to try to make the cha trung hap myself. The blog is really easy to follow and the pictures of the dishes look delicious and amazing. 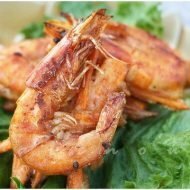 I’ve tried this couple’s other dishes and they’re absolutely AMAZING!!! Miscelaineous–very cool sign on. You can eat our food any time! This dish looks just amazing guys! I’m drooling and swooning all over your delicious pictures, wow! I would totally pay BIG BUCKS for your final dish! Love the step by step pictures too! WoRC–We love readers who are “de nui” too! No need to pay big bucks, a tour of the garden will do just fine! Enjoyed your pictures and recipes so far! Just one thing about this posting: the expression in Vietnamese should be “dễ nuôi.” Cheers! 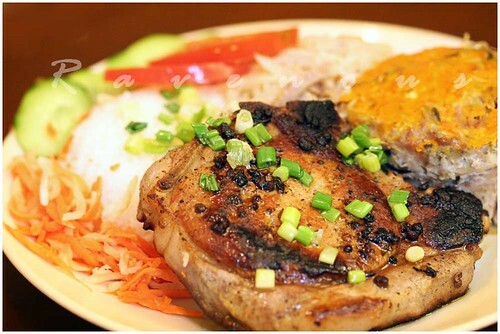 This is one favourite dish we order everytime we go to a Viet restaurant. My kids never tire of eating this dish. Thanks for sharing and congratulations on this new blog! I feel it’s going to be one of my favourite site! Wow,very nice photos. I love your heading “Celebration of Swine”,Hilarious! I have been loking for a recipe for this egg custard for 3 years!! Everything here looks delilcious and I have already printed about 15 recipeis to try very very soon!! entyce68: thank you so much for your comments and reading our blog! do let us know how our recipes go for you! Thanks for your tips about using annatto seeds. I have been wondering where to get that bright orange color egg yolk! we really apologize for this. this was first post ever and don’t know if that’s a typo when we transfered the blog over to wordpress recently, but that is a lot. 1 ts is more like it. Sorry!! Thanks for the fast reply Ravenous Couple, I look forward to attempting it again. look forward to see more vietnamese dishes from you. as you cook more, it gets more intuitive and you wont’ necessary have to worry about how many tbs or ts…it will just look right to you..let us know how it turns out! This is a favorite in our house, we call it pork, pork & pork, but I adore the Celebration of Swine moniker! I am so glad to have found your blog. A tip on how to make broken rice at home: take regular jasmine rice, cover with water. Place in freezer for a couple of hours. Crush grains of rice with your hands until you get fairly uniform size of grain. Cook as usual. Hi guys. Just wanted to let you know that the 1tbs salt was fixed on the page, but if you use the Printable Recipe feature, it is still showing up as 1 tbs instead of 1 ts.